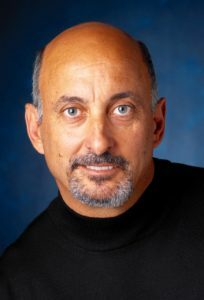 Bobby Rahal, Indy 500 winner, driver, team owner, businessman and President of the Road Racing Drivers Club was honored by the RRDC with the 2019 Phil Hill Award. 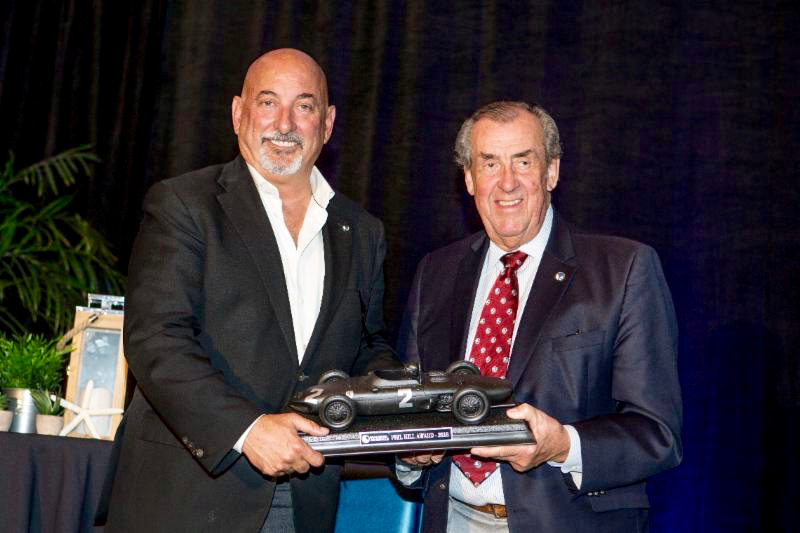 David Hobbs, the 2018 award recipient, made the presentation at the annual RRDC members’ dinner on January 23 prior to the running of the Rolex 24 At Daytona, the season opener of the 2019 IMSA WeatherTech SportsCar Championship. The Phil Hill Award has been presented annually since 1993 to the person who the RRDC feels has rendered outstanding service to road racing. The recipient may be a driver, entrant or outstanding member of a sanctioning body. It is named in honor of America’s first Formula 1 World Champion (in 1961), and is not only a tribute to his masterful accomplishments on the race track, it also recognizes his contributions as a great ambassador for the sport. Phil Hill passed away in 2008. Robert “Bobby” Woodward Rahal was born in Medina, OH, in 1953, and started in SCCA’s Formula Atlantic Series and then European Formula Two. In an 18-year career spanning F1, Can-Am, Le Mans/IMSA, and CART, Rahal notched three CART championships, including the 1986 Indy 500 win, and wins at the 1981 24 Hours of Daytona and the 1987 12 Hours of Sebring. 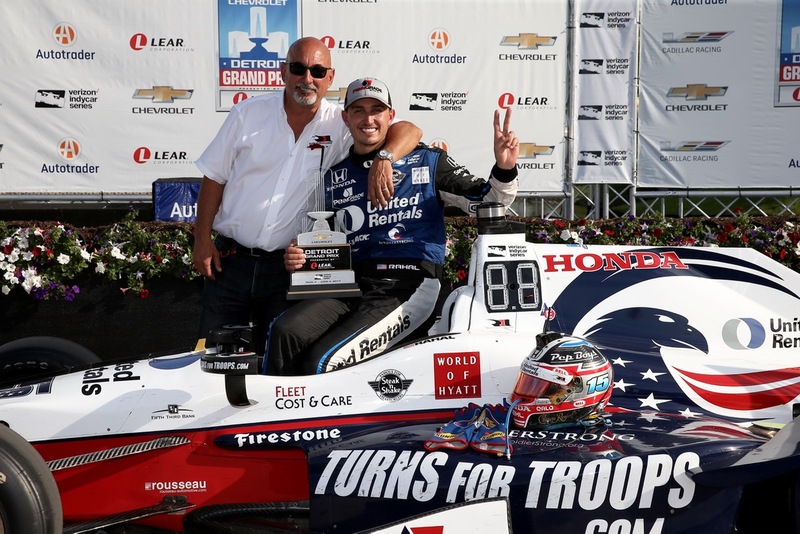 In open-wheel racing, Rahal started 264 races for five teams and scored 18 poles and 24 wins. He collected back-to-back CART championships in 1986 and 1987, and picked up his third in 1992. When Buddy Rice won the 2004 Indy 500, Rahal became only one of a handful of individuals to win the Indy 500 as both a driver and a team owner. After retiring from driving in 1998, he joined Jaguar’s F1 effort; later became the interim boss of CART. Along with David Letterman and businessman Michael Lanigan, he is a principal in Rahal Letterman Lanigan Racing and has developed some of the top young talent in open-wheel racing, including his son Graham Rahal, above, after winning in Detroit 2017, Takuma Sato, Buddy Rice, Danica Patrick, and many others. He also brought Honda into North American open-wheel racing in the early 1990s, that has produced for Honda 16 driver crowns and more than 237 victories including 12 Indy 500 wins. His team won the 2010 GT team and manufacturers titles in the American Le Mans Series (ALMS) with BMW and swept the top two spots in the 2011 12 Hours of Sebring, earning the 2011 ALMS GT drivers championships for Joey Hand and Dirk Mueller. In 2012, the team earned back-to-back Sebring wins and was second in the Team Championship and third in the Manufacturer Championship. In 2013 BMW Team RLL earned two wins, seven podium finishes and four poles en route to second place in the Driver, Team and Manufacturer Championships. In 2014, the team joined the United Sports Car Series (USCC), later renamed the IMSA WeatherTech SportsCar Championship. Since 2014, BMW Team RLL has totaled 17 wins, 23 poles and 68 podiums and second place in the Manufacturer, Team and Driver championships in 2015 and 2017. In 2018, the team brought BMW its first victory with the all-new M8 GTE and followed up with back-to-back wins, six podiums and three poles over the two-car program. in 2018, the team also entered the world’s first production-based electric vehicle race series – the Jaguar I-PACE eTROPHY – with a two-car effort. “Getting the Phil Hill award last year meant a hell of a lot to me,” said David Hobbs, above, right, “because obviously any award from the RRDC is very important to a racing driver. For me, as one of the older members who was around when Phil was driving it was particular poignant because he was a hero of mine. He had some incredible races in the very early 1960s when I was just starting.